Last month I did a guest article for Jemima Gibbons monthly newsletter on Freshbusinessthinking.com about Social Media Monitoring and Analytics. In that same newsletter Nikki Pilkington argued why WordPress is a good choice for your website. I decided I wanted to argue, passionately, the opposite, and my article has just been published there this month. Here is the BTZ version. First I need to disclose that I’m a stakeholder in a particular CMS/Platform developer (author of WordFrame and PageTypes). However, I’ll try and explain my case as objectively as possible.The first thing to say is that Nikki’s article starts with a vital, core truth – whether your website is created by you, some experts in your team, website developers you’ve hired or an external agency, it needs a content management system (CMS) at its heart. You need to be in control of the content without needing technical expertise. You shouldn’t be paying an agency or a developer every time you want to change a word, add a page, or move a menu option. But is WordPress the right CMS for your website? WordPress is great for blogging – I used it for my own blog for a couple of years, but it wasn’t designed as a CMS platform. It can edit blog posts and static pages, but it has to be “bent” in to being a CMS, either by someone developing code, or by deploying a plug-in or framework add-on that changes the administration back end in to a CMS. Even then it may not be that user friendly. It’s easier and more flexible to work with a product that was designed from scratch as a website CMS with usability for non-technical people as part of the design criteria. There is a huge library of add-ons and widgets for WordPress, but the quality of the code and the support available for them is a big variable. Some are great, but if the particular widget you need is developed by an individual programmer in the Ukraine or Hong Kong working in their spare time, getting support when you need it or when something goes wrong might be very tricky, and what about the documentation? Much of the time there isn’t any. WordPress software updates can vary in terms of upgrade complexity and time. You are also heavily dependent on the particular set of widgets and plug-ins you need for your site’s functionality. Are they supported in the new version? Sometimes you may need to rework the entire site when a new version comes out. WordPress wasn’t designed with Search Engine Optimization (SEO) in mind, but there are plug-ins you can add to gain access to the internal areas and HTML tags that are important, or to create SEO friendly URLs for each page. That’s OK, but they are add-ons with mixed levels of support – it would be so much better if the SEO possibilities were designed in to the core of the platform from scratch. WordPress is a blogging platform, so it’s easy to provide a blog with a comment stream along with the conventional pages and other content that you need for your site. Things get a bit more complicated when you want multiple blogs, or to have a conversation around all of the content on your site, or to create a community. There are add-ons like BuddyPress that can help, but there are better platforms where the page management and blog structure have been designed for multiple conversation threads. How about supporting multiple users? 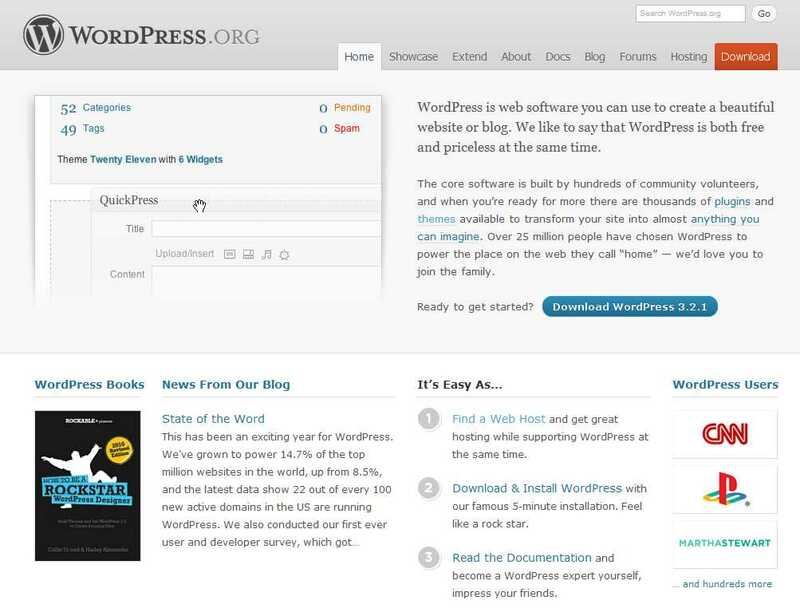 WordPress started as a single user blogging platform. Over time it has added multi-user and multi-site capability and some user administration roles. As usual there are add-ons to get round some of the restrictions, but that brings us back to the integration and support problems. It would be so much better to have a CMS that has user security and flexible administration designed in from scratch. WordPress is free isn’t it? The code is open source and you aren’t charged a licence fee. However, that’s just one part of the cost equation. You need the site to be hosted. You need design work. You need expertise to assemble and integrate the plug-ins and add-ons for your particular functional needs. Then you need to support the site and all of these widgets over time as new WordPress releases come out. Cost of ownership of the site soon adds up. Actually WordPress themselves offer 4 levels of VIP “commercial grade” support for companies. The basic package costs $15,000 per year per seat, up to Enterprise level at $250,000 per year per seat (yes, that’s a six figure sum per year!). That’s true, and their rates can be reasonable – but you are definitely going to need some of those experts to support your site, unless you plan on doing a lot of homework and website DIY. That’s true, but a lot of them look so similar – it’s pretty easy to spot a WordPress based site. Of course you can get great design from a good website designer too, but that will be pretty much the same cost as for any good CMS platform. The better CMS providers give your designer free rein over what they can do with your site. It’s Open Source – that’s good isn’t it? The open source development approach can bring huge benefits to a product where you have a large community of developers all working on enhancing and adding to the product for free. But everything comes with a cost. The open source approach is probably the biggest weakness for WordPress – for me it’s the killer. It means that the development community understands the platform inside out and can exploit the security flaws that are there. Take a look at the WordPress Pharma Hack – your site could be taken over by spam adverts for Viagra and Cialis. The WordPress developer community, large as it is, has not been able to fix this hack completely – sites get re-infected even after a clean re-install. Look at what you need to do if you get infected. I have many friends who moved away from WordPress for this reason alone. You know there is something seriously wrong when you see Google ads for companies like White Fir Design who make a living from cleaning up hacked WordPress sites. Do you want to leave your company or brand open to that kind of risk? So in summary, WordPress is a great blogging platform, although the security concerns worry me. As your website CMS I think it is a poor choice, and I’m concerned that so many agencies build their sites on this platform. There are open source CMS products like Joomla or Drupal. They have their own strengths and weaknesses, but they are also infected by that same Pharma Hack (Joomla and Drupal). My advice would be to choose a good, proprietary CMS product, probably based on safe and secure technology such as Microsoft .Net and MS SQL Server. When you compare the total cost of ownership, they can be more cost-effective than a WordPress based approach, as well as safer, and more easy to use. I happen to know and support a good one (feel free to contact me), but please do some Google research of your own. A version of this post first published on Fresh business thinking. I read your article. You could easily write the same type of article about any type of (CMS) product. It seems clear you are not a fan or advocate of Open Source. I had to laugh out loud when I read “probably based on safe and secure technology such as Microsoft .Net and MS SQL Server”. You know the greatest problem in the world is Spam and Viruses, I would say 99% is due to the fact that Microsoft is fundamentally broken architecturally, it is effectively a virus incubator, and then infects and re-infects, just like a normal virus does. Hard to build a solution on a technology that causes most of the pain in the world for any serious users, not to mention the underlying additional cost of H/W, and S/W licenses, and the how many add ons/plugins or third party products to make it work or be supportable.